Dow Theory relies on volume as a secondary indicator to confirm price action. Nonetheless, interpreting market volume has developed into a whole branch of technical analysis (volume spread analysis) and spurred many traders to create volume indicators. In this review, we will focus on trading low volume pullbacks in trends. Like everything else in trading, absolute values are useless. Rather than “low”, we actually mean “lower”. We look at changes in volume. When volume increases, traders are interested. When volume decreases, traders are not keen. The market does not move when traders are not interested. So, the idea is to fade low volume moves. This is a weekly chart of SPDR Straits Times Index ETF (ES3.SI on SGX). It seeks to replicate the performance of the STI which is the main gauge of Singapore’s equity markets. Volume overlays are great trading tools. They allow you to keep tabs on volume while you look at price action. They mitigate the risk of ignoring price action and focusing only on volume. In this case, green means higher volume than the previous bar, and red means lower volume. If you are a member of our Traders’ Library, get the overlay here. If not, click here to find out how to get this overlay. After moving up to test the SMA, price plunged down below the earlier swing low with higher volume (as shown by the green background). It confirmed that bearish momentum was still in place. As prices pulled back up, it seemed as though we would not have a low volume trading setup. The pullback bars rose up sharply with higher volume. However, the bearish outside bar halted the up thrust and signaled the return of the bears. Two bars later, we got an up bar with lower volume. It verified the lack of market interest in pushing prices higher. The next bar was a solid bearish reversal bar. We sold a tick below its low. It took 15 weeks, but this trade proved profitable as the ETF fell to its earlier extreme low. This is a daily chart of Walmart. Shortly after price moved above the SMA, it made a new high with higher volume. However, if we extended our perspective, we would have noticed that price failed to rise above a key resistance that sent prices down below the SMA earlier. This failure made the picture less rosy. We had a low volume pullback followed by a bullish reversal bar. We entered a tick above the reversal bar. The trade’s maximum profit potential is larger than the amount we risked. However, the trend did not resume until it moved below our signal bar to test our stop-loss level. 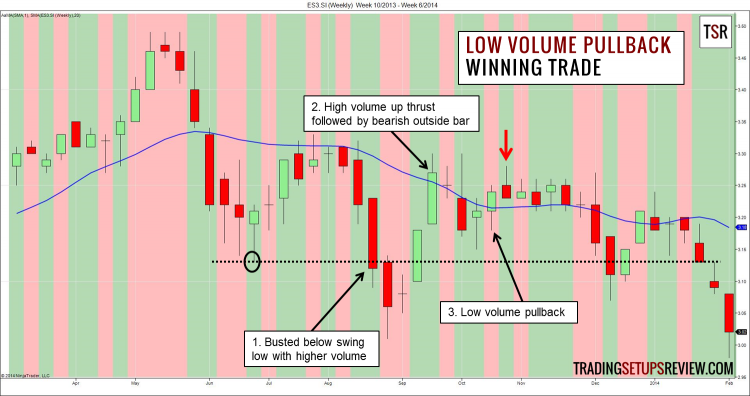 We used basic volume trading principles directly to create this simple low volume pullback trading strategy. We looked for increasing volume during break-outs to confirm the market momentum. Then, we took advantage of low volume pullbacks to time when we enter the momentum. 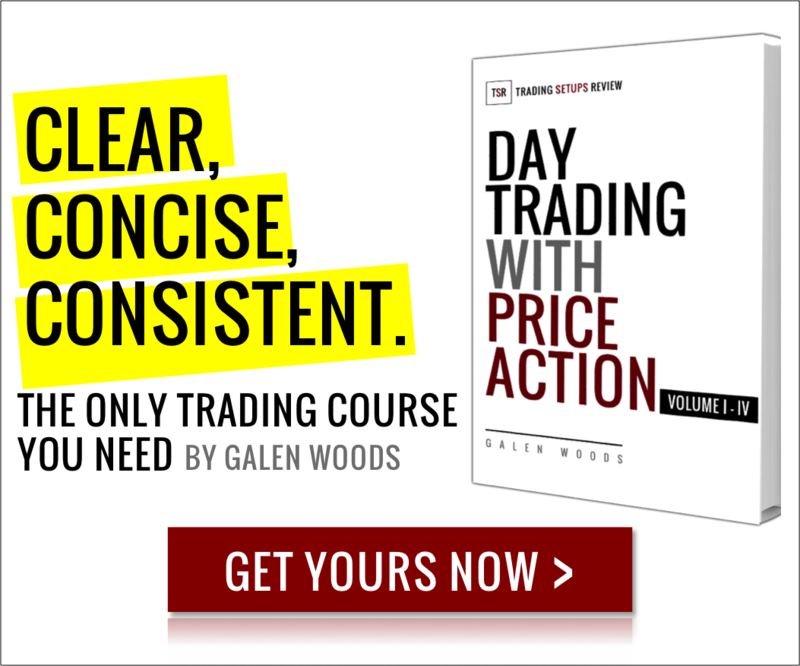 This trading strategy is extremely useful for clarifying price action. When you can’t tell what price is trying to do, volume might shed some light. Paying attention to low volume pullbacks also improves other retracement trading strategies. 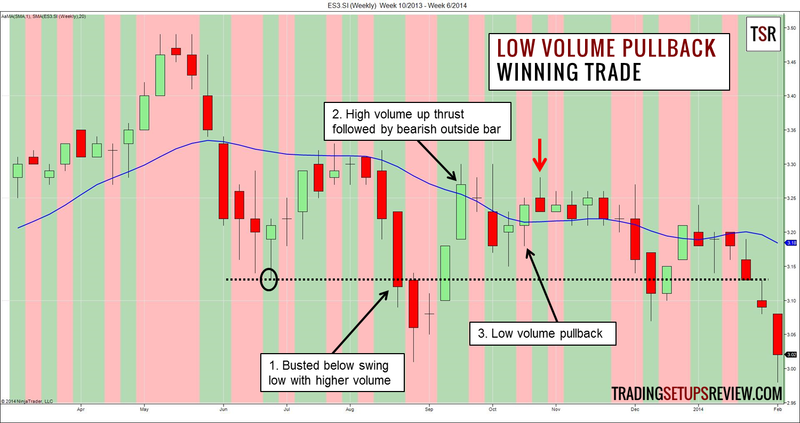 Combine this low volume approach with the following setups. Want to learn more about this strategy? 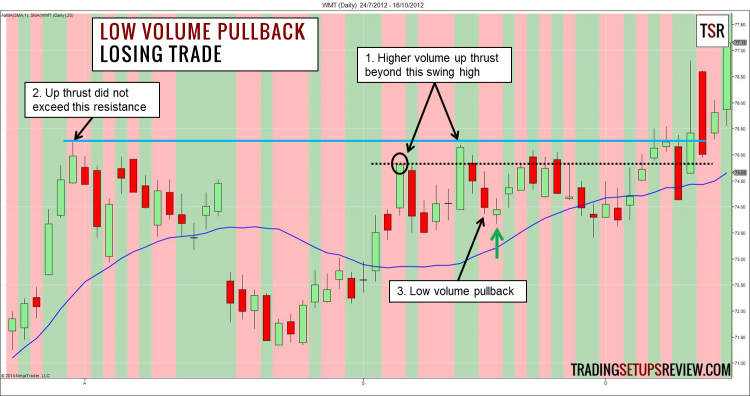 Look at my second article on the low volume pullback strategy. If you want to pick up more ideas about using volume in trading, have fun with these. Excuse me. I dont know what is the indicator that show red and green area ? Hey DemonTrader, check your email. I’ve sent the indicator to you. It’s a pretty simple indicator that just colours the background of the chart according to volume changes. If the volume this bar is higher than the last, it’s green. If not, it’s red. Hi Galen Woods. Sr about my bad English. I’ve recieve your emaill. Thanks very much. And ofcouse I will be like your fanpage, I really like TSR and your write too. Finally, Will you write somethings about Harmonic Patterrn or Elliott wave ? I’m looking forward that. The most conservative target is the last trend extreme. For a long setup, it refers to the highest price point reached before the market started to retrace downwards. You can also consider more ambitious targets using the methods in the article – 10 Ways To Take Profit. Click here to learn more about getting the background color indicator. Follow the instructions for Example 3 to get the volume chart colour.